I received the black version at no cost for evaluation and review. I love tablets and my Dragon Touch in particular, but I'm always afraid of dropping it. 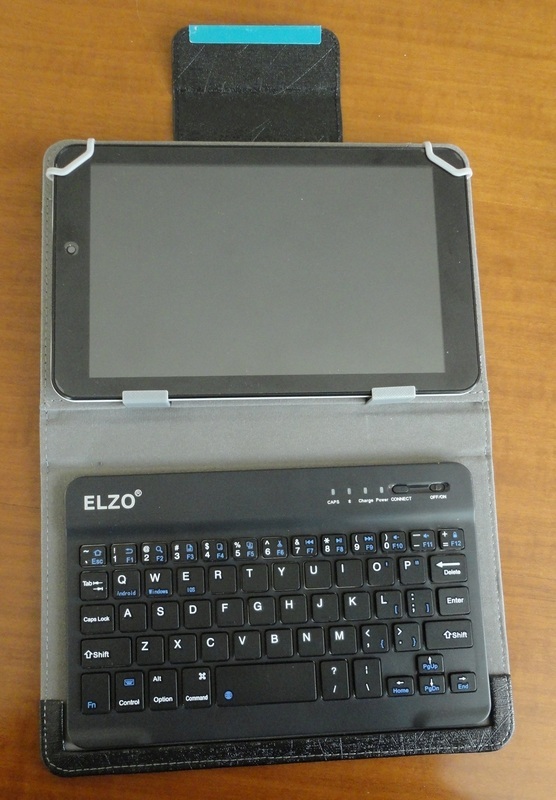 This protective case has the great advantage of including a fully-functional Bluetooth keyboard, making any tablet into a mini-laptop you can carry in your handbag. 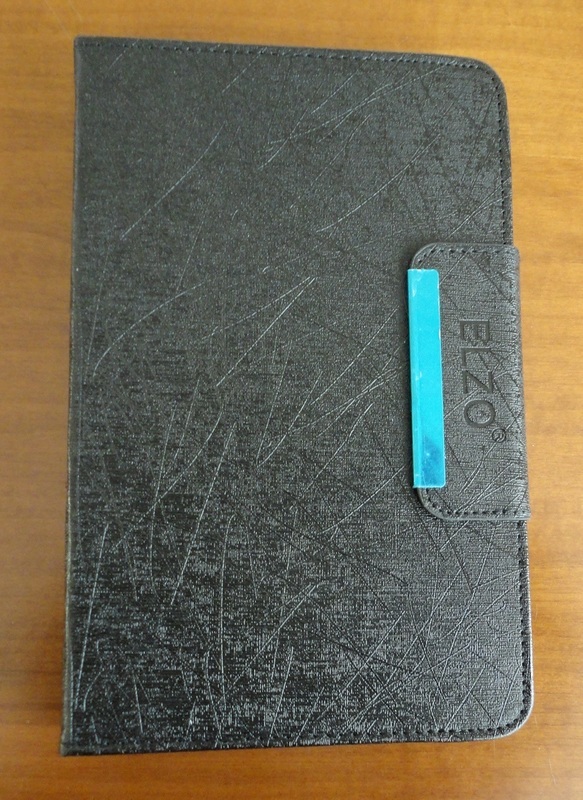 The case is made of a textured synthetic material with a light grey suede-like interior lining. It's elegant and practical and equally suitable for men and women. The design is very clever and beautifully executed. The closure is a magnetic flap that folds over the top. At the back there is another magnetic prop that folds out to support the tablet at whatever angle you wish (up to 45 degrees). Inside, the super-thin Bluetooth keyboard (a black version in my case) is magnetically secured to the base and held in position at the bottom by a small raised edging. 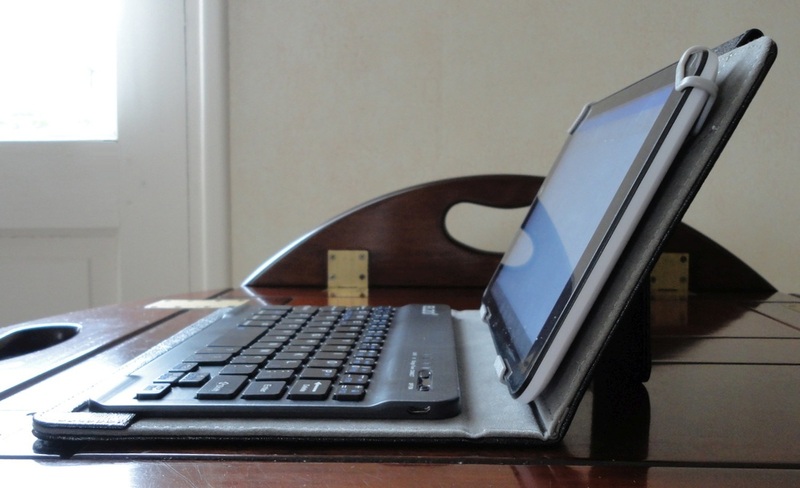 On the other side there are two plastic brackets to hold the bottom of your tablet and two upper corners, attached to strong elastic. Once these are hooked over the top of the tablet, you slide them sideways until they hug the corners and you have an extremely solid unit that looks great. 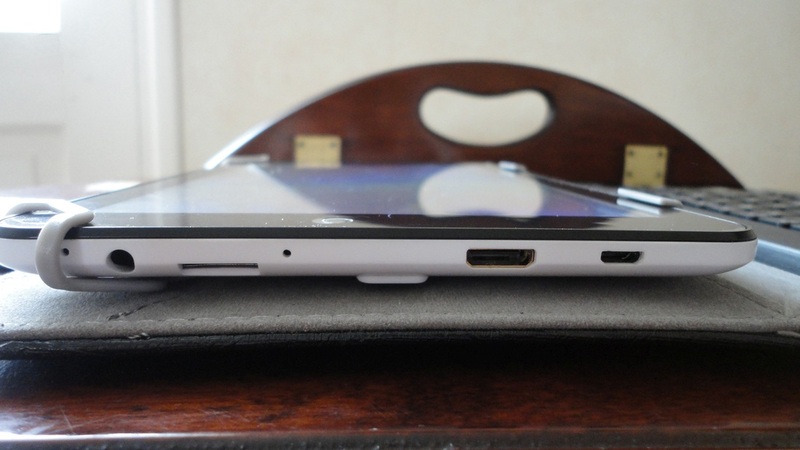 When closed, these corners rest on the edges of the keyboard, preventing contact with the face of your tablet. 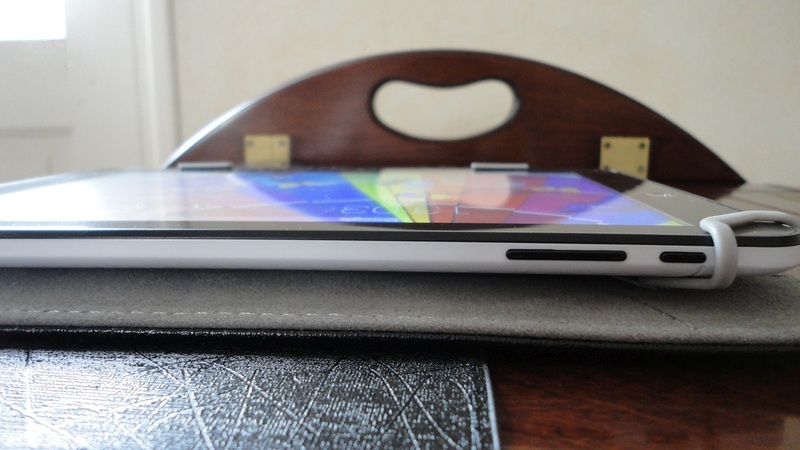 This case is designed for tablets from 7 to 8 inches wide (there is a larger model for 8 to 10 inch). Mine is 8.4 inches, so near the maximum. All the ports and buttons are accessible and I think the whole ensemble looks terrific and all of one piece. The keyboard needs to be charged for a couple of hours with the enclosed USB cable. Stated autonomy is 80 hours. I haven't reached the end of my first charge yet. There is an On/Off button that can be left On for regular use, and a Connect button to do the Bluetooth pairing; a blue LED flashes and you need to select among your paired devices (the keyboard is recognized as “Bluetooth 3.0 Keyboard”). If a 6-digit code is required, it is provided. I only had to enter it the first time, and when I switch the keyboard off. I dislike using virtual keyboards and holding a tablet while I use it. This clever case improves my experience in every way. The keyboard is small but the main letter keys are large enough to give a normal typing experience. It's a great device that does not add a lot of bulk or weight but makes my tablet so much more enjoyable. I also love that it's suitable for many brands. 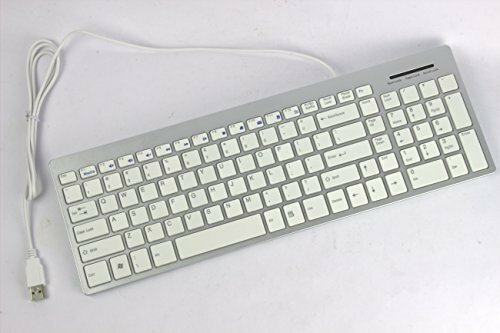 This small keyboard is a really cute but functional item, ideal to add the convenience of a standard keyboard to portable devices, such as tablets and smartphones, that have Bluetooth functionality. The keyboard paired instantly with my Kindle Fire HD. A unique numerical code is necessary each time to connect the keyboard to the Kindle. It is shown in the dialogue box and there is no need to memorize it as it changes every time. Apparently, with some devices this code-entering step is not always needed, but I found that my Kindle will not connect automatically after the first pairing. Instead, I need to "forget" the keyboard and pair from scratch. This brings up the code-validating screen and then all is well. I'm inclined to think that this inelegant functionality is due to the Kindle programming. For its part, the little keyboard is terrific. It has an edgy look, white keys on aluminium, and I really like its slight back-to-front slope, which facilitates typing. The keys are identical in size to those of a standard keyboard, they have a comfortable spring action and respond as I would expect. 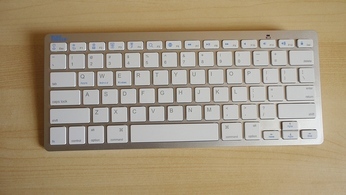 There are multiple function keys at the top, whose action may vary depending on the device connected, and three custom keys for Apple, Android and Windows systems. The <delete> key behaves like a backspace. I thought this would be confusing but, when typing continuously, I actually find it very handy. The cursor keys help when jumping around on the page, and the <enter> and <escape> keys are useful to navigate through different functions. The layout is QWERTY but American style, so a few symbols will not be in the same place as in the UK type. This can be solved by customizing the keyboard via the Control Panel, Regional and Language Options in Windows, so that what you type matches the keys you hit. Next, I paired the keyboard with my laptop, again by entering the provided numerical code (with the keyboard left on, no fresh pairing is needed). I love my laptop but find typing on it challenging. It's a stretch to reach the keys and I make lots of mistakes because my hands get tired of hovering. So this works perfectly. The keyboard runs on two AAA batteries (not included) which are said to last an amazing 700 hours, no doubt aided by the automatic sleep function. I use rechargeables but, even so, that is an impressive lifespan. 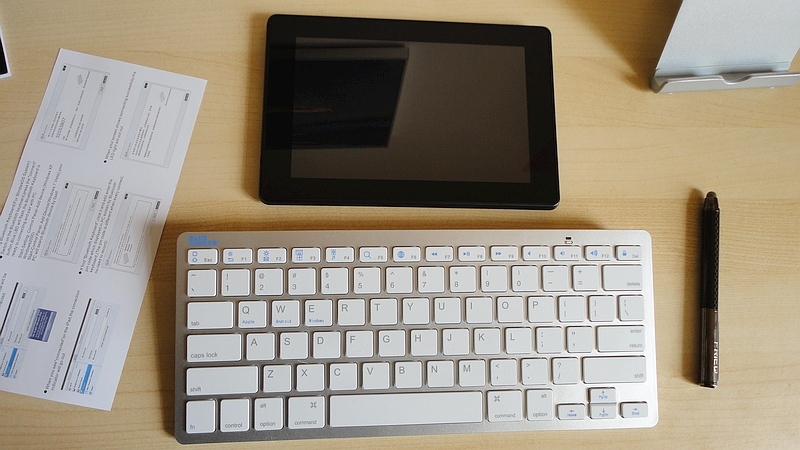 Even with the two batteries in, the keyboard is extremely light, and therefore, portable. If your older equipment does not support Bluetooth, provided you have an audio jack available, you could try using one of those tiny transmitters (like the TaoTronics TT-BA06) to enable connectivity. If you are in the market for a portable mini-keyboard, this model would be an excellent choice and at this price (under £12) it is superb value for money. 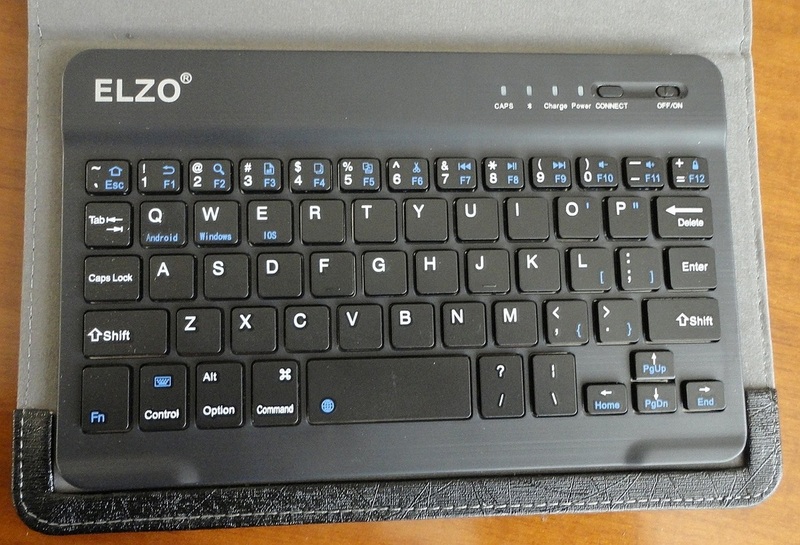 A lovely, lightweight, standard size keyboard with wired USB connection. On my pc, Vista recognized the peripheral instantly and loaded three drivers. The same happened with my laptop, running Windows 8.1. So, trouble-free installation on both. 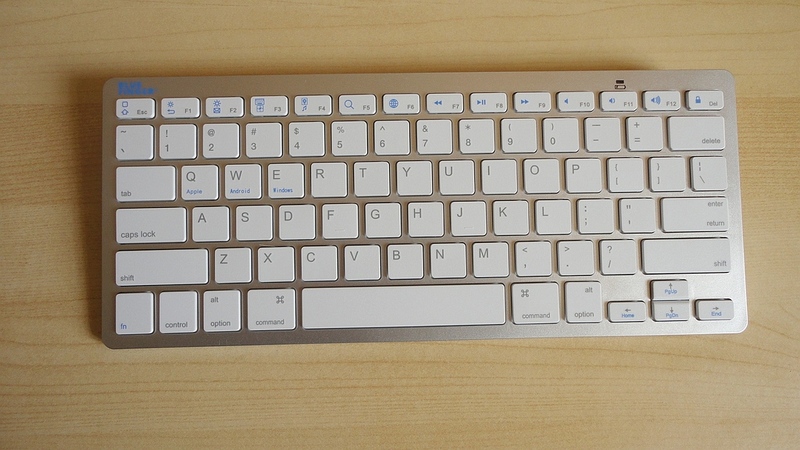 The design is classically clean and neutral: white keys over an aluminium base. 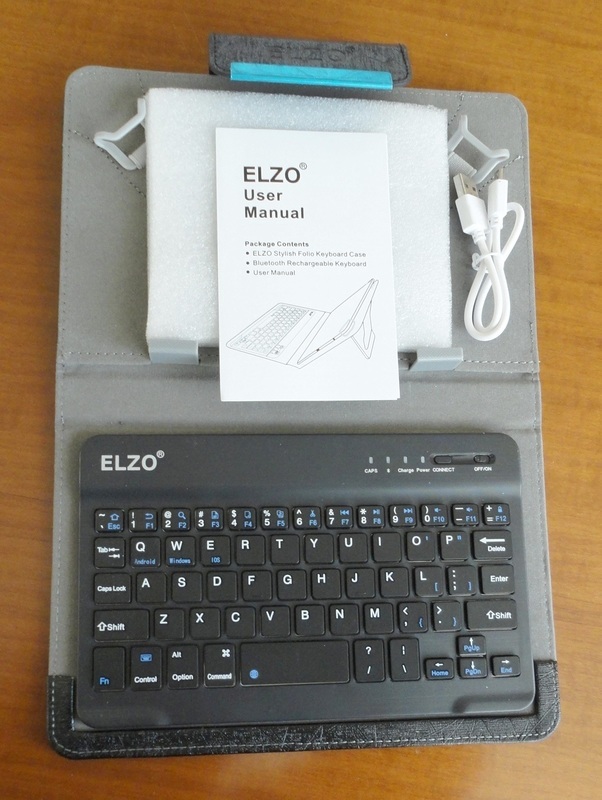 Two retractable feet lift the back to facilitate typing. It includes function keys and a number pad. The Num Lock, Caps Lock and Scroll Lock lights are bright green and show like lit sections of a top light bar. They are very difficult to miss, which is a good thing. The layout is QWERTY, but American style. The differences with a UK layout are few but it may be confusing to have to remember that the quotation marks (“) and @ are switched, and the hashmark (#) and a few other keys are not where you would expect them to be. Fortunately, one can change keyboard layouts by way of the Control Panel, Regional and Language Options in Windows. The keyboard is extremely light but feels solid and steady. I type with all ten fingers and found the action of the keys very pleasing and easy to master. The keys have limited travel, more like those of a laptop, but the quiet click and positive spring-back give a good, responsive feel. Because it is so light and portable, I sometimes connect it to my laptop, especially when I have to do a lot of typing away from home. It adds almost no weight to my laptop bag and I much prefer typing on it than stretching to reach the keys on the native one. I love this keyboard and think it is great value for money. I love my laptop but hate typing on it. Reaching the keyboard is a real stretch and I make lots of mistakes because my hands get tired of hovering. When Seitech asked me to try out this wireless combo, I was happy to accept. Installation is extremely easy: two AAA batteries are required for the keyboard and one for the mouse (the documentation says they are included, but that's a typo, they are not). According to the specs, they will provide a staggering 700 hours of continuous keyboard use. Stashed inside the mouse is the tiny USB dongle which controls the wireless communication. Just plug it into an unused USB port on your device, and both keyboard and mouse are instantly recognized. On my laptop, the integrated keyboard and mouse pad remain operational. One good feature is that the Bluetooth keyboard will automatically enter sleep mode when inactive, thus saving battery life. This particular keyboard is full-sized and it includes function keys and a number pad. There is another model without the number pad. The layout is of the QWERTY type, which is what I'm used to, although this Bluefinger model has the American layout. The differences are few but it may be confusing to have to remember that the quotation marks (“) and @ are switched, and the hash mark (#) and a few other symbol keys are not in the same location as on a UK keyboard. Fortunately, one can change keyboard layouts by way of the Control Panel, Regional and Language Options in Windows, so that what you type matches the keys you hit. The keyboard is super-light but sits solidly with a slight forward tilt which facilitates typing. 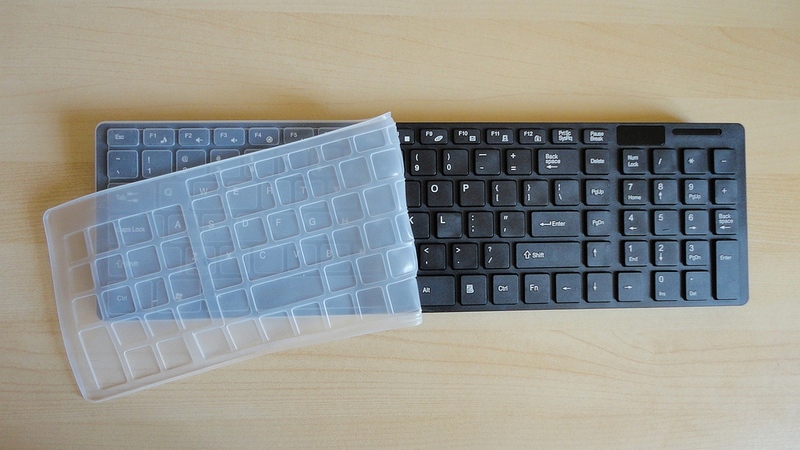 It comes complete with a thin, tacky, slightly opaque plastic cover which is preformed to exactly fit the shape of the keys. It can be used as dust protection but, since it also allows normal typing, it is invaluable to stops crumbs and, particularly, liquids from entering. I know several people who have ruined a keyboard by spilling coffee over it. I find the action smooth and responsive, with or without the protective cover. The keys have limited downward travel but good spring, very similar to those of my laptop, so the feel is almost identical. The mouse is very small and very light, too, and this may be its main drawback as I find it difficult to be completely accurate with it. Its removable cover feels a little delicate, but it only needs to be handled when storing the dongle and removing the battery which is recommended, when this set is not in regular use. Actually, the mouse would suit the small hand of a child even better than that of the average adult. 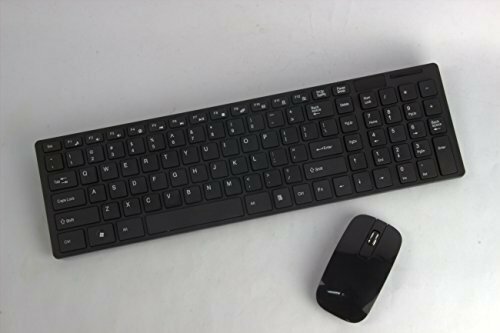 Another great application for me is to use this wireless combo with my Kindle Fire HD to benefit from the convenience of a conventional keyboard and mouse. The only extra step is to connect the USB dongle with a micro USB OTG converter cable (a very inexpensive item which allows USB connectivity for tablets and smartphones that only have a micro port). The extremely light weight means that I can carry keyboard and mouse easily in my hold-all whenever I'm on the go. All in all, I love this Bluetooth set and find it great value for money.